How long can economic growth continue in a finite world? This is the question the 1972 book The Limits to Growth by Donella Meadows and others sought to answer. The computer models that the team of researchers produced strongly suggested that the world economy would collapse sometime in the first half of the 21st century. To explain the situation, I will first explain why we are reaching Limits to Growth in the near term. I will then provide a list of nine reasons why the near-term crisis has been overlooked. In simplest terms, our problem is that we as a people are no longer getting richer. Instead, we are getting poorer, as evidenced by the difficulty young people are now having getting good-paying jobs. As we get poorer, it becomes harder and harder to pay debt back with interest. It is the collision of the lack of economic growth in the real economy with the need for economic growth from the debt system that can be expected to lead to collapse. The reason we are getting poorer is because hidden parts of our economy are now absorbing more and more resources, leaving fewer resources to produce the goods and services we are used to buying. These hidden parts of our economy are being affected by depletion. For example, it now takes more resources to extract oil. This is why oil prices have more than tripled since 2002. It also takes more resource for many other hidden processes, such as deeper wells or desalination to produce water, and more energy supplies to produce metals from low-grade ores. The problem as we reach all of these limits is a shortage of physical investment capital, such as oil, copper, and rare earth minerals. While we can extract more of these, some, like oil, are used in many ways, to fix many depletion problems. We end up with too many demands on oil supply–there is not enough oil to both (1) offset the many depletion issues the world economy is hitting, plus (2) add new factories and extraction capability that is needed for the world economy to grow. With too many demands on oil supply, “economic growth” is what tends to get shorted. Countries that obtain a large percentage of their energy supply from oil tend to be especially affected because high oil prices tend to make the products these countries produce unaffordable. Countries with a long-term decline in oil consumption, such as the US, European Union, and Japan, find themselves in recession or very slow growth. Figure 1. 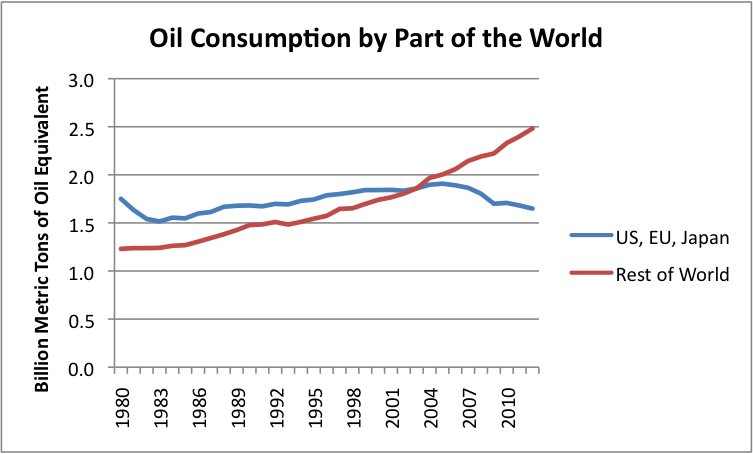 Oil consumption based on BP’s 2013 Statistical Review of World Energy. Unfortunately, the problem this appears eventually to lead to, is collapse. The problem is the connection with debt. Debt can be paid back with interest to a much greater extent in a growing economy than a contracting economy because we are effectively borrowing from the future–something that is a lot easier when tomorrow is assumed to be better than today, compared to when tomorrow is worse than today. We could not operate our current economy without debt. Debt is what has allowed us to “pump up” economic growth. Consumers can buy cars, homes, and college educations that they have not saved up for. Businesses can set up factories and do mineral extraction, without having past profits to finance these operations. We can now operate with long supply chains, including many businesses that are dependent on debt financing. The ability to use debt allows vastly more investment than if potential investors could only the use of after-the-fact profits. If we give up our debt-based economic system, we lose our ability to extract even the oil and other resources that appear to be easily available. We can have a simple, local economy, perhaps dependent on wood as it primary fuel source, without debt. But it seems unlikely that we can have a world economy that will provide food and shelter for 7.2 billion people. The reason the situation is concerning is because the financial situation now seems to be near a crisis. Debt, other than government debt, has not been growing very rapidly since 2008. The government has tried to solve this problem by keeping interest rates very low using Quantitative Easing (QE). Now the government is cutting back in the amount of QE. If interest rates should rise very much, we will likely see recession again and many layoffs. If this should happen, debt defaults are likely to be a problem and credit availability will dry up as it did in late 2008. Without credit, prices of all commodities will drop, as they did in late 2008. Without the temporary magic of QE, new investment, even in oil, will drop way off. Government will need to shrink back in size and may even collapse. In fact, we are already having a problem with oil prices that are too low to encourage oil production. (See my post, What’s Ahead? Lower Oil Prices, Despite Higher Extraction Costs.) Other commodities are also trading at flat to lower price levels. The concern is that these lower prices will lead to deflation. With deflation, debt is strongly discouraged because it raises the “inflation adjusted” cost of borrowing. If a deflationary debt cycle is started, there could be a huge drop in debt over a few years. This would be a different way to reach collapse. Why couldn’t others see the problem that is now at our door step? 1. The story is a complicated, interdisciplinary story. Even trying to summarize it in a few paragraphs is not easy. Most people, if they have a background in oil issues, do not also have a background in financial issues, and vice versa. 2. Economists have missed key points. Economists have missed the key role of debt in extracting fossil fuels and in keeping the economy operating in general. They have also missed the fact that in a finite world, this debt cannot keep rising indefinitely, or it will grow to greatly exceed the physical resources that might be used to pay back the debt. Economists have missed the fact that resource depletion acts in a way that is equivalent to a huge downward drag on productivity. Minerals need to be separated from more and more waste products, and energy sources need to be extracted in ever-more-difficult locations. High energy prices, whether for oil or for electricity, are a sign of economic inefficiency. If energy prices are high, they act as a drag on the economy. Economists have missed the key role oil plays–a role that is not easily substituted away. Our transportation, farming and construction industries are all heavily dependent on oil. Many products are made with oil, from medicines to fabrics to asphalt. Economists have assumed that wages can grow without energy inputs, but recent experience shows the economies with shrinking oil use are ones with shrinking job opportunities. Economists have built models claiming that prices will rise to handle shortages, either through substitution or demand destruction, but they have not stopped to consider how destructive this demand destruction can be for an economy that depends on oil use to manufacture and transport goods. Economists have missed the point that globalization speeds up depletion of resources and increases CO2 emissions, because it adds a huge number of new consumers to the world market. Economists have also missed the fact that wages are hugely important for keeping economies operating. If wages are cut, either because of competition with low-wage workers in warm countries (who don’t need as high a wages to maintain a standard of living, because they do not need sturdy homes or fuel to heat the homes) or because of automation, economic growth is likely to slow or fall. Corporate profits are not a substitute for wages. 3. Peak Oil advocates have missed key points. Peak oil advocates are a diverse group, so I cannot really claim all of them have the same views. One common view is that just because oil, or coal, or natural gas seems to be available with current technology, it will in fact be extracted. This is closely related to the view that “Hubbert’s Peak” gives a reasonable model for future oil extraction. In this model, it is assumed that about 50% of extraction occurs after the peak in oil consumption takes place. Even Hubbert did not claim this–his charts always showed another fuel, such as nuclear, rising in great quantity before fossil fuels dropped in supply. In the absence of a perfect substitute, the drop-off can be expected to be very steep. This happens because population rises as fossil fuel use grows. As fossil fuel use declines, citizens suddenly become much poorer. Government services must be cut way back, and government may even collapse. There is likely to be huge job loss, making it difficult to afford goods. There may be fighting over what limited supplies are available.What Hubbert’s curve shows is something like an upper limit for production, if the economy continues to function as it currently does, despite the disruption that loss of energy supplies would likely bring. A closely related issue is the belief that high oil prices will allow some oil to be produced indefinitely. Salvation can therefore be guaranteed by using less oil. First of all, the belief that oil prices can rise high enough is being tested right now. The fact that oil prices aren’t high enough is causing oil companies to cut back on new projects, instead returning money to shareholders as dividends. If the economy starts shrinking because of lower oil extraction, a collapse in credit is likely to lead to even lower prices, and a major cutback in production. 4. Excessive faith in substitution. A common theme by everyone from economists to peak oilers to politicians is that substitution will save us. There are several key points that advocates miss. One is that if a financial crash is immediately ahead, our ability to substitute disappears, practically overnight (or at least, within a few years). Another key point is that today’s real shortage is of investment capital, in the form of oil and other natural resources needed to manufacture the new natural gas powered cars and the fueling stations they need. A similar shortage of investment capital plagues plans to change to electric cars. Wage-earners of modest means cannot afford high-priced plug in vehicles, especially if the change-over is so fast that the value of their current vehicle drops to $0. Another key point is that the alternatives we looking at are limited in supply as well. We use far more oil than natural gas; trying to substitute natural gas for oil will lead to a shortfall in natural gas supplies quickly. Ramping up electric cars, solar, and wind will lead to a shortage of the rare earth minerals and other minerals needed in their production. While more of these minerals can be accessed by using lower quality ore, doing so leads to precisely the investment capital shortfall that is our problem to begin with. Another key point is that electricity does not substitute for oil, because of the huge need for investment capital (which is what is in short supply) to facilitate the change. There is also a timing issue. If the limit on coal and natural gas extraction is really a limit on investment capital (including oil), and this investment capital limit may manifest itself as a debt limit, then the situation is different. In such a case, high investment in intermittent renewables can expected to drive economies that build them toward collapse more quickly, because of their high front-end investment capital requirements and low short-term returns. 5. Excessive faith in Energy Return on Energy Investment (EROI) or Life Cycle Analysis (LCA) analyses. Low EROI returns and poor LCA returns are part of our problem, but they are not the whole problem. They do not consider timing–something that is critical, if our problem is with inadequate investment capital availably, and the need for high returns quickly. EROI analyses also make assumptions about substitutability–something that is generally not possible for oil, for reasons described above. While EROI and LCA studies can provide worthwhile insights, it is easy to assume that they have more predictive value than they really do. They are not designed to tell when Limits to Growth will hit, for example. 6. Governments funding leads to excessive research in the wrong directions and lack of research in the right direction. Governments are in denial that Limits to Growth, or even oil supply, might be a problem. Governments rely on economists who seem to be clueless regarding what is happening. Researchers base their analyses on what prior researchers have done. They tend to “follow the research grant money,” working on whatever fad is likely to provide funding. None of this leads to research in areas where our real problems lie. 7. Individual citizens are easily misled by news stories claiming an abundance of oil. Citizens don’t realize that the reason oil is abundant is because oil prices are high, debt is widely available, and interest rates are low. Furthermore, part of the reason oil appears abundant is because low-wage citizens still cannot afford products made with oil, even at its current price level. Low employment and wages feed back in the form of low oil demand, which looks like excessive oil supply. What the economy really needs is low-priced oil, something that is not available. Citizens also don’t realize that recent push to export crude oil doesn’t mean there is a surplus of crude oil. It means that refinery space for the type of oil in question is more available overseas. The stories consumers read about growing oil supplies are made even more believable by forecasts showing that oil and other energy supply will rise for many years in the future. These forecasts are made possible by assuming the limit on the amount of oil extracted is the amount of oil in the ground. In fact, the limit is likely to be a financial (debt) limit that comes much sooner. See my post, Why EIA, IEA, and Randers’ 2052 Energy Forecasts are Wrong. (a) The researchers did not include the financial system to any extent. In particular, the models left out the role of debt. This omission tends to move the actual date of collapse sooner, and make it more severe. (b) The original model did not look at individual resources, such as oil, separately. Thus, the models gave indications for average or total resource limits, even though oil limits, by themselves, could bring down the economy more quickly. I have noticed comments in the literature indicating that the Limits to Growth study has been superseded by more recent analyses. For example, the article Entropy and Economics by Avery, when talking about the Limits to Growth study says, “ Today, the more accurate Hubbert Peak model is used instead to predict rate of use of a scarce resource as a function of time.” There is no reason to believe that the Hubbert Peak model is more accurate! The original study used actual resource flows to predict when we might expect a problem with investment capital. Hubbert Peak models overlook financial limits, such as lack of debt availability, so overstate likely future oil flows. Because of this, they are not appropriate for forecasts after the world peak is hit. Another place I have seen similar wrong thinking is in the current World3 model, which has been used in recent Limits to Growth analyses, including possibly Jorgen Randers’ 2052. This model assumes a Hubbert Peak model for oil, gas, and coal. The World3 model also assumes maximum substitution among fuel types, something that seems impossible if we are facing a debt crisis in the near term. 9. Nearly everyone would like a happy story to tell. Every organization from Association for the Study of Peak Oil groups to sustainability groups to political groups would like to have a solution to go with the problem they are aware of. Business who might possibly have a chance of selling a “green” product would like to say, “Buy our product and your problems will be solved.” News media seem to tell only the stories that their advertisers would like to hear. This combination of folks who are trying to put the best possible “spin” on the story leads to little interest in researching and telling the true story. Wrong thinking and wishful thinking seems to abound, when it comes to overlooking near term limits to growth. Part of this may be intentional, but part of this lies with the inherent difficulty of understanding such a complex problem. There is a tendency to believe that newer analyses must be better. That is not necessarily the case. When it comes to determining when Limits to Growth will be reached, analyses need to be focused on the details that seemed to cause collapse in the 1972 study–slow economic growth caused by the many conflicting needs for investment capital. The question is: when do we reach the point that oil supply is growing too slowly to produce the level of economic growth needed to keep our current debt system from crashing? It seems to me that we are already near such a point of collapse. Most people have not realized how vulnerable our economic system is to crashing in a time of low oil supply growth.